Who Is The Class Act Again? 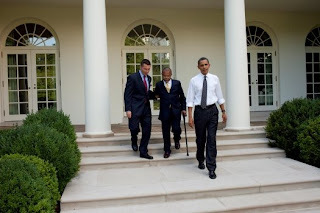 In the first photo, we have President Obama posturing for the cameras while the obviously racist Crowley helps the disabled Gates down the stairs. 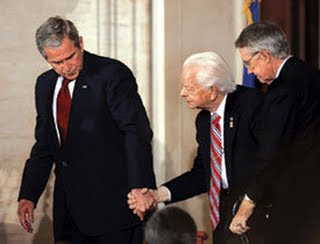 Below we see how President Bush treated the elderly. No care for how he looks for the cameras, he just did what he thought was right. Hmm... I don't know about that Frank.. convenient photos.